Ma création de février est un éloge à Clara Parkes. Les deux modèles sont extraits de son nouveau livre, The Knitter's Book of Wool et ont été tricotés avec la laine mérino organique de Swans Island. J'ai suivi les conseils de Clara et tricoté les mitaines, "Sweet Fern Mitts", avec des aiguilles de 3.75mm. Pour le bonnet, "Hill Country Hat", j'ai utilisé des aiguilles de 4.5mm. Verdict? Trente dollars pour une pelote de 230 mètres, ce n'est pas si cher si l'on considère les mailles presque parfaites, la douceur de la laine, et le fait qu'une pelote suffit pour un bonnet et une paire de mitaines. Mille mercis à Emma, Faustine, Aurélie et Fred d'avoir tout organisé. Vite, je file voir les créations de tout le monde ICI! Défi means "challenge" in French. The idea is to show a finished project on the 13th of the month (with a different theme every month) in order to ward off bad luck, but really it's about having fun and trying something outside of your comfort zone. Défi 13 is the sequel to Trico'13 which occurred in 2009 and only involved knitting. For Défi 13, you can either knit or sew. The theme for February was "white". My February finished object is a tribute to Clara Parkes. The two patterns are taken from her new book, The Knitter's Book of Wool, and were knitted with Swans Island Organic Merino. I followed Clara's advice and knitted the Sweet Fern Mitts using US 5 needles. 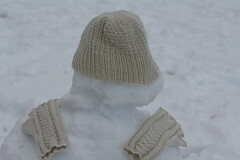 For the Hill Country Hat, I used US 7 needles. My opinion? Thirty dollars for 250 yards is not so bad once you take into account the stitch definition, the softness of the yarn, and the fact that I was able to get a pair of mitts and a hat out of one skein. Many thanks to Emma, Faustine, Aurélie et Fred for organizing this. I'm off to look at everybody's finished projects HERE! Pardon my French | Parlez-vous franglais?